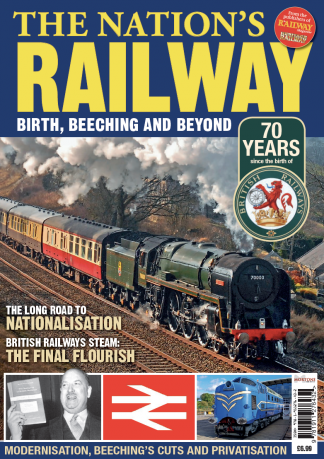 This bookazine marks 70 years since Britain’s railways were taken into state control on January 1, 1948. It will look at why they were nationalised after the Second World War, something the current Labour party is calling for to happen again. One chapter will examine the Locomotive Exchanges of 1948, where flagship engines from the Big Four companies were swapped between each other and trialled competitively. The question will be asked, why didn’t Britain follow the USA and replace steam, but instead built 999 steam locomotives between the late Forties and 1960. Early closures will be examined, along with the 1955 Modernisation Plan that called for the eradication of steam in favour of diesel and electric traction. The early diesels will be discussed as will the soaring losses made by British Railways, and the appointment of Dr Beeching, who ultimately wielded his axe on the railways of Britain. The bookazine will conclude with the end of steam in 1968. Be the first person to tell us what you think about The Nation&apos;s Railway and you'll save £2.50 on your next purchase!